Rossdorf, Germany: – Water treatment specialist EnviroChemie has ramped up its high technology modular process water capabilities to meet growing demand from pharmaceutical and industrial customers worldwide. EnviroChemie has expanded its process water division with new staff, capacity and integrated modular systems. Global demand for the company’s ‘Made in Germany’ high quality capabilities has grown in response to increasing water stress and emphasis on sustainability and environmental protection, with customers increasingly focusing on integrated modular systems for the treatment of fresh water and process water, water circulation systems and wastewater. In response, EnviroChemie has expanded its production of integrated systems that not only produce the required water quality, but also deliver more resource and energy-efficient plant operation. “For example, we are able to treat partial flows so that higher proportions of water and resources can be recovered,’ said Klaus Dickhoff, Director Process Water at EnviroChemie. “Additional sources such as surface water, well water, brackish and sea water can all be tapped and treated,” explained Dickhoff. Typical tasks include the production of demineralized (demin) water, flue gas wastewater treatment, clean and pure water treatment, systems for water and /or resource recycling, if possible with energy saving, or the desalination of brackish and sea water for industrial applications. “Such process engineering projects can be quite complex. Our customers come from utilities, chemical and oil-refining industry, metal industry and automotive, semiconductor, solar and nanotechnology, the optical industry, from research centers and universities or large-scale plant engineering,” said Dickhoff. EnviroChemie has been developing, building and installing treatment plants for process water for nearly 40 years. They are tailored to each specific task, and operate in an economical and environmentally friendly manner. As a partner, EnviroChemie also ensures customer service and the supply of water treatment products for the operation of the process water treatment plants. 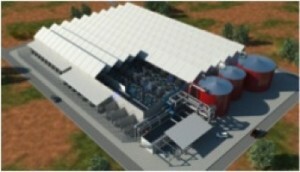 It also optimizes existing plants, or takes over the complete operation on request. EnviroChemie can apply unrivalled experience to continuous development of innovative and reliable industrial water and wastewater technologies. Click on EnviroChemie opens taps on process water capabilities for other information.